OK, first of all I have to admit that I feel ever so slightly bad pitching two products from the same family into full-on war. It’s not a nice thing to do, especially when one is a speccy geek who stinks of fish and the other is a flash younger brother who probably drives a Porsche Boxster. Yes, we’re talking about Dr Perricone’s two quite similar products, ‘No Foundation Foundation‘ and, from the SUPER range, the ‘Sun Kissed’ tinted moisturiser. I have both in front of me right this minute and I can tell you that the bottles are identical, apart from the labels (obviously!) and the fact that the Perricone MD product (main line, premium skincare) has been formed from dark glass. Now I’m not going to do photos for this test, because quite frankly it’s a waste of time. I’ve spent whole evenings before trying to ‘capture’ the essence of a barely-there product and it’s both frustrating and ultimately unhelpful. A bit like taking a picture of a waft of perfume. So I shall talk you through my battle as it happens and that way you can experience all of the cries and squooshy sounds as swords go into flesh and horsemen get stuck in the mud. Or something. SUPER is Perricone’s new range; younger, cheaper, and not scented with eau de fish. The Sun Kissed tinted moisturiser (30ml) has SPF25 and also Turmeric. 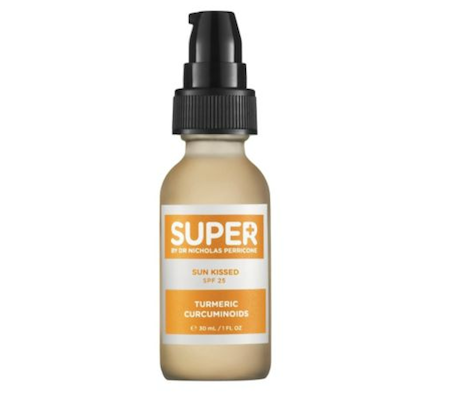 Which is a superfood, and so blatantly will be a good addition to a tinted moisturiser. How do they perform? Well. Geeky Fish Nerd applies beautifully. The shade is a warm, rich neutral that blends out to an almost imperceptible layer of beautifying colour. It sinks straight into the skin with very little effort and actually, the fish smell isn’t half as bad in this product as I remember. It’s hardly there at all, in fact. Sun Kissed is harder to get into the skin, but only marginally. It is very slightly lighter in tone than the MD but it seems to swirl about on the skin for a while before allowing itself to be fully rubbed in. Interestingly, though, after a few minutes it’s the SUPER Sun Kissed that has fully absorbed, leaving an almost matte finish, whereas the MD has a dewy, rich finish with an amount of residue that – though not at all unpleasant – is definitely on the oilier side rather than the matte. The victor? It’s actually surprisingly close, considering that I thought the SUPER to be a clear winner. If you had dry or mature skin, then I would say go for the MD No Foundation Foundation without a doubt – it’s nourishing and contains the high-performance ingredients that Perricone is famed for. It also only costs £6 more than the SUPER, £38.50 on BeautyBay here! Those with young, oilier skins will prefer the Sun Kissed which is £32.50 from Boots here. I must say that I’m really quite shocked by how my perception of the MD product has changed – it’s utterly gorgeous! I’m glad I decided to do a comparison – you know how I love a tinted moisturiser and now I have another (treatment-led!) version to add to my collection. Not much in it price-wise, either, is there? Next Post The Cheapest Matte Lip Colour EVER.